PennsylvAsia: "A New Korean War?" at Church of the Redeemer in Squirrel Hill, February 18. "A New Korean War?" 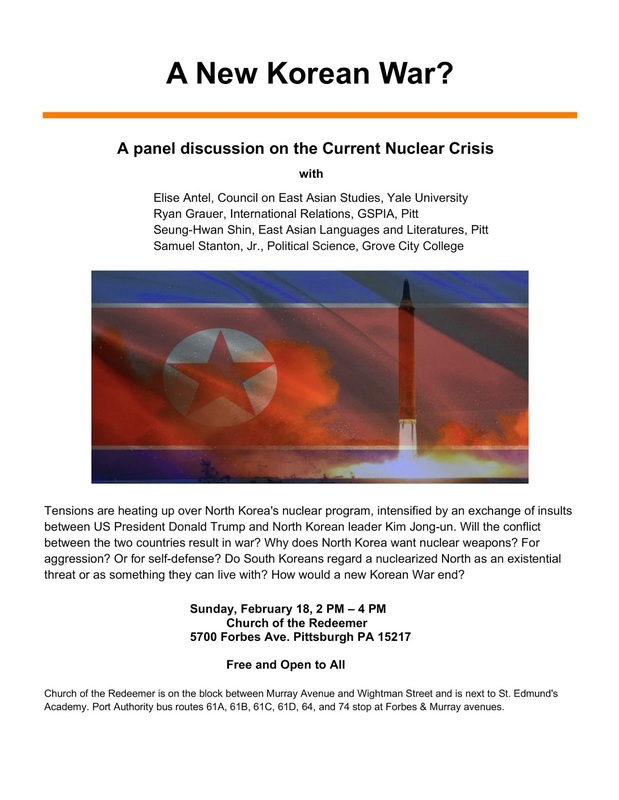 at Church of the Redeemer in Squirrel Hill, February 18. Tensions are heating up over North Korea's nuclear program, intensified by an exchange of insults between US President Donald Trump and North Korean leader Kim Jong-un. Will the conflict between the two countries result in war? Why does North Korea want nuclear weapons? For aggression? Or for self-defense? Do South Koreans regard a nuclearized North as an existential threat or as something they can live with? How would a new Korean War end? The event runs from 2:00 to 4:00 pm and is free and open to the public. The Church of the Redeemer is located at 5700 Forbes Ave. (map).